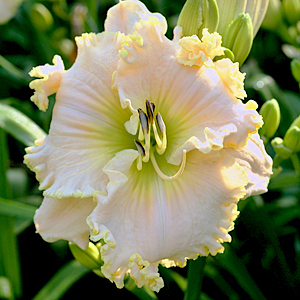 APPLE BLOSSOM WHITE (Dan Trimmer) Tetraploid (Sdlg. x Unknown) 33" E. Re. Ev. 6 1/4" (Sdlg. #8-37) This round, very ruffled beauty is my whitest introduction to date. 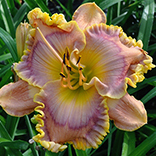 A fine gold edge surrounding the petals gives a finish to a flawless blooms day after day. Fertile both ways, two lateral branches and a terminal yield about 25 buds per scape.